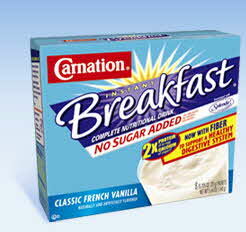 CARNATION INSTANT BREAKFAST No Sugar Added Powders are now available with added fiber and SPLENDA. Providing at least three grams of fiber in every serving, 21 essential vitamins and minerals, including twice the protein of an egg, and twice the calcium of yogurt* , CARNATION INSTANT BREAKFAST No Sugar Added Powders now offer better nutrition and better flavor. It’s a fact. Americans need more fiber in their diet. The average American gets onlyabout 50 percent of the recommended amount of fiber each day. Fiber plays an important role in supporting a healthy digestive system. Recent studies suggest that people with higher fiber intake may lower their risk of developing certain health conditions, such as high cholesterol, coronary heart disease, and diabetes. According to recent consumer research, SPLENDA is the no-calorie sweetener of choice with 51 percent preference vs. 3 percent for aspartame. With no sugar added, this new product offers consumers a great way to moderate sugar intake at breakfast and throughout the day. Look for more product information and recipe ideas on CarnationInstantBreakfast.com. CARNATION INSTANT BREAKFAST No Sugar Added Powders are now available in supermarkets nationwide.